FindItMore | In the United Kingdom, electricity is the leading cause of fires in homes. These accidents cause the loss of 70 lives and 350,000 injuries annually. Each year, electrical faults are responsible for more than 20,000 house fires. These statistics are compounded by the fact that there are more electrical appliances in homes today than ever before. Most of the electrical equipment uses sophisticated technology- microwave ovens, cookers, HVAC systems. They need high voltage power to operate. There are more than enough reasons to observe diligence in installation, use and maintenance of electrical appliances. If the damage is to be reduced, homeowners need to regularly check and repair electrical faults in their houses. Discover signs that your electrical systems need an overhaul. Before attempting any diagnosing procedures, know that your safety comes before anything else. Switch off all power appliances and disconnect the main switch in the fuse box. If you are not qualified, call a registered electrician to do the job for you. More importantly, use the right tools and equipment for testing electrical current and repairing parts. Wear protective clothing such as solid boots and gloves. Always let the electrician check the performance of all fuses first. As they prevent accidents, circuit breakers are perhaps the most important fixtures in a home. When electrical current flowing to your house exceeds the recommended level, a circuit breaker stops the danger. They act by preventing an overload, and hence prevent accidental fires. After that, you should have blown out fuses replaced. If the problem persists, that is a sign of major fault elsewhere. Let a licensed electrical expert diagnose the problem. In addition, he should install the right size of circuit breakers for the circuit they serve. Alternatively, invest in arc fault circuit interrupters (AFCIs). These are advanced gadgets that provide advanced hazard protection. Perhaps the most important fuse is the one on the main switch. In case of an emergency, the fuse disconnects all power from running in your house. This reduces the likelihood of accidents. In cases where your house is served by electric heaters, there may be a number of consumer units. Ensure that all outlets and switches are functioning correctly. If any of these is not working as it should, that is an indication of unsafe wiring. Instead of waiting for a fire to start, call a technician and have them repaired or replaced immediately. If any outlet or switch is warm to touch, that is as much a sign of unsafe wiring as discolored ones. Because they could trigger an electrical hazard, stop using them. Label them as faulty for all house occupants to see. Only a licensed technician should repair and approve them for use again. 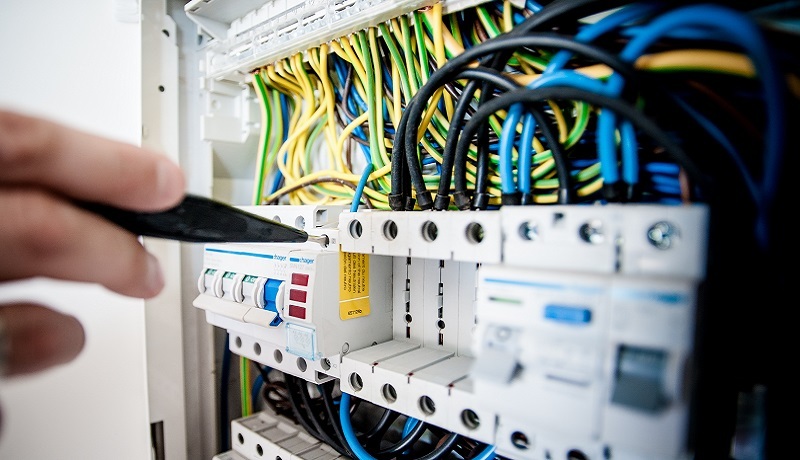 If any of the switches and outlets makes a buzzing or crackling sound, or any other unusual noise, it could have loose electrical connection among other unsafe wiring problems. At the same time, avoid using plugs that fit snugly into outlets as this may cause overheating and ultimately result in a fire. Common signs of damaged or faulty cords include cracking and fraying. In case of such faults, the cords may harbour exposed wires that cause shock and fire. You should either replace the specific faulty cord or the entire appliance. Similarly, when the wiring is too old, replace it with new wiring, even if it does not show evident signs of danger. Otherwise, if cords have been pinched or pricked by furniture, windows and doors, the insulation starts wearing off. To avoid this, move the furniture or let the cords run along a safer route. Do not fasten cords in place using nails, pins, or staples. Doing this leads to tampering with the strands of wire inside. Have the damaged cord removed to lower the risks of fire and electrical shock. Cords running under a carpet or rug are an electrical hazard, as there isn’t enough air circulating around them. Plugging an appliance to an outlet is safer than using extension cables throughout. Extension cables are meant for temporary use. Cords that are folded or wrapped may be damaged at points where the insulation is weak. During installation, repair and maintenance, always ensure that the earth connection is done securely. All green and yellow wires are meant for earth connection. Otherwise, brown wires should go to live connection while blue ones should go to neutral. The basic electrical appliance is the light bulb. While it may look simple, it can cause unprecedented damage. Wrong bulb wattage causes overheating of the fixture and eventually fire. Therefore, ensure you use the correct wattage bulbs in all light fixtures and lamps. If you are unsure, consider bulbs of 60 watts and below. Keep all appliances, such as iron boxes, toasters, heaters and electric kettles away from power cords. When cords come in contact with heat, the insulation melts away, leaving the live wires exposed. Read and follow instructions for safe use of all electrical appliances. PREVIOUS POST Previous post: Are You Missing Out the Perfect Oral Care of Your Children?